. . . this is the work of a master at the very top of his game . . . [Dessner] weaves a sublime spell as the music ebbs and flows through a whole range of emotions. It's contemporary yet reverential, ambitious yet enjoyable and, for anyone who thought he was just a guy who played guitar in another (admittedly brilliant) rock band, something of an education. Never before have classical and rock converged in so organic, compelling and sensual a way as they do in the three short orchestral works by New York composer and guitarist Bryce Dessner on his new release . . . Despite this broad spectrum of influences, his voice remains individual and distinct. The works performed here with de Ridder show Dessner to be a composer of surprising independence of mind . . . The same is true of Jonny Greenwood . . . With this album, Bryce Dessner and Jonny Greenwood open up a new frontier for symphonic music. These are no dabblers or interlopers; they take the development of classical "chops" very seriously . . . [Dessner / "St. Carolyn by the sea", "Lachrimae", "Raphael"]: Several of his sweeping crescendos are worthy of John Adams or Philip Glass. On "St. Carolyn by the Sea" and "Raphael", Dessner neatly incorporates clear-sounding electric guitars and percussion writing that give the pieces the impetus of a rock drummer but, when the entire section is going hell for leather, writ large. In the work "Lachrimae", there are also more delicate passages filled with sustained strings that are particularly affecting. Although Greenwood's piece is the one that is a suite from a film score, there is a cinematic quality to passages in Dessner's music too. Some of "St. Carolyn's" more thrilling passages could easily be heard alongside a top notch suspense film . . . [in Greenwood's] Suite from "There Will be Blood", I'm particularly smitten with the overlaid glissandos and chordal intensity of the movement "Henry Plainview." Where there is repetition or the use of ostinato, as on "Future Markets," it is more off kilter, frequently shorn off in dramatic fashion. And even though each movement of the suite is distilled from a film score cue, these aphoristic vignettes are vividly detailed and characterful. So forget your preconceptions about "rock stars" as classical dilettantes: Dessner and Greenwood are the real deal.
. . . "St. Carolyn by the Sea" and its brethren are terrific pieces of music by any stretch . . . both pieces are indepently stunning . . . Greenwood's "There Will Be Blood" suite receives a softer focus, playing to the music's elongated strengths. Dessner's works are a tremendous leap forward for the composer and sets the bar very high for any indie-pop musician who wants to take a stab at classical composition. Combined under André de Ridder's guiding hand and Deutsche Grammophon's professional stamp of integrity, "St. Carolyn by the Sea/There Will Be Blood" will go down as a modern classic. It can't be anything else.
. . . one sign, among many, of shifting cultural tides . . . Greenwood's "There Will Be Blood" suite is foreboding and inky-black, a work whose extended quotes of Penderecki and Ligeti do nothing to obscure the thumbprint of Greenwood's sensibility . . . The slow-fall-in-free-space glissandi that punctuate the "Henry Plainview" movement, the most obvious Ligeti touch, break open into plangent, lovely string writing, a push-pull between furtive remorse and throbbing evil keeps the piece from curdling. Dessner's surprisingly mordant sensibility is a match for Greenwood's. On his "St. Carolyn By the Sea", moaning tremolos pass like a fever chill through the orchestra and show up in the guitars a few minutes later, goose flesh prickling the music's surface. There are guitars in the work, but they are twinkling and demure, and often feel like they are murmuring to quiet the upheaval of the shuddering beast that is the full orchestra. The work builds to a martial tattoo of an ending and cuts off, leaving its sharp outline visible in our minds. Dessner's ear for string writing is particularly rich . . . "Raphael", builds from wispy tendrils of sound into a super-saturated moment of full orchestral color, a blazing sunrise burning fog off of a river . . . It is glacial, patiently ecstatic, and further evidence that Dessner's vision could support some large-scale works. Whoever wants to commission his first symphony would probably be rewarded with something fantastic.
. . . Dessner and Greenwood's atmospheric pieces do complement each other. Dessner's side . . . features gentle guitar from Bryce and brother Aaron, skittering violins and snare-driven crescendos -- in particular, the lovely title track. As for Greenwood's "There Will Be Blood" suite from 2007, I won't even review it, because you should already love it.
. . . [there's more to Dessner's] music than just emotion (which even if there wasn't that would be good enough), but he has brains. He has an ear for acoustics, he has musical instinct and he isn't afraid to take a risk . . . his compositions organically fuse the traditional symphony orchestra with electric guitars in such a way that in all my travels through electro-acoustic soundscapes, I've never heard something so convincing . . . Dessner may be lachrymose and solemn much of the time, but it isn't melancholy or dreadful. What strikes me most is how musical he is . 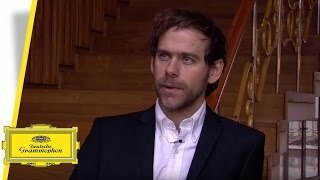 . . Dessner sounds very natural; the long form composition suits him well. Tight and compact, but expansive and expressive . . . in the great tradition of film score composers making their music into orchestral suites, Greenwood has unified his score into a wholly satisfying treat.
. . . [these compositions] sound fresh and inquisitive. Sensitive performances by the Copenhagen Phil.
. . . [Bryce Dessner's] visceral and distinctive brand of "cosmic Americana" is evident throughout the three orchestral works . . . "St Carolyn by the Sea" suffuses its harmonic richness with a longterm rhythmic momentum . . . ["Lachrimae"]: works for strings by Britten and Bartók are . . . points of reference behind a piece whose gradual intensifying of mood does not undermine its essential poise. Most arresting here is "Raphael", where Dessner's electric lead -- lucid and scintillating by turn -- is the focal point across music whose increasingly combative manner is tellingly curtailed prior to a speculative close. Music such as this demands a committed and focused response, which it receives from the Copenhagen forces under the expert direction of André de Ridder. The suite from Jonny Greenwood's Academy-nominated score to "There Will Be Blood" is no mere fill-up. Its six movements draw on those salient qualities of the original soundtrack . . . pointing up the often plangent timbral and textural contrasts which make the Radiohead guitarist's music apposite to Paul Thomas Anderson's epic fable of disillusion. Both composers benefit from suitably "wide-screen" sound, setting the seal on [the] release. Orchestral works by Bryce Dessner and Jonny Greenwood that complement each other very well . . . [Dessner / "St. Carolyn by the sea"]: This is an often dramatic and always very effective score that provides much attractive music . . . [Dessner / "Lachrimae"]: This is a most effective and unusual work . . . [Dessner / "Raphael"]: some lovely textures, so finely wrought and showing Dessner's fine ear for colours and textures . . . there are some gorgeous, rich textures that emerge as the piece develops; minimalist in nature, but always catching the ear with their fine colouring . . . [Greenwood / Suite from "There will be blood"]: It is beautifully orchestrated with woodwind subtly adding to the texture and colour . . . ["Proven lands"]: There is some terrific playing here in this spectacularly fine piece of string writing. A gentle calm arrives with "Oil", a movement that rises in drama, occasionally, but overall there is a warmth and resignation to this music. This suite sits together well as a separate work with some exceptionally fine string writing. Conductor André de Ridder likes to programme these two composer together and one can easily see why as they complement each other very well. Greenwood perhaps provides greater form and melody whereas Dessner gives us fine textures and colours in a more minimalist framework. The Copenhagen Philharmonic conducted by André de Ridder provide first rate performances, with notable contributions form Bryce and Aaron Dessner, and are finely recorded . . .